FC Rosette claimed a 2-1 win at Scalby Reserves to earn pole position in the third division, with former leaders Eastway losing 4-1 at Filey Town 3rds. Rosette claimed a deserved 2-0 half-time lead at Carr Lane thanks to a tap-in from Wayne Shaw and a cracking run and strike from 18-year-old striker Louis Hird. Scalby were on top after the break and got themselves back in it when Dan Gregory's corner was headed in superbly by John Bateman. Only a great save from Mikey Harland denied Karl Hansell an equaliser, as Scalby piled on the pressure but Rosette stood firm. Hird was named as the man of the match for Rosette, while veteran Jez Clifford was the star man for the hosts. Filey Town 3rds grabbed a shock 4-1 win at Oliver's Mount against a severely depleted Eastway Sports. Jonny Hunter's free-kick was spilled by the Eastway keeper and Aaron Howard reacted quickly to put Town 1-0 up and then Howard struck again before the break to make it 2-0 at half-time. Filey sealed the win with a Darren Clough spot-kick after he had been fouled in the penalty area, and Clough's second made it 4-0 to Brandon Milner's team. Oli Coyle's late effort was a mere consolation for Eric Hall's side, whose man of the match was keeper Jordan Wood. Hunter was the Town star man at centre-back with keeper Adam Chilvers also impressing. Fishburn Park Reserves earned a 5-3 win at home to Westover Wasps Reserves at Oliver's Mount. An own goal put Park in front early on, Spanish star Diego Romero adding a second from the spot after he had been fouled. A 30-yard screamer from Callum Halley made it 3-0 at the break and youngster Halley headed in Park's fourth after the interval. Callum Myers pulled a goal back for Westover from the spot, but Fishburn added a fifth when sub Tom Wardell forced his way though to score a fine solo goal. Myers and Rob Whitehead scored one apiece late on but Park had done more than enough to seal the win. Josh Crabtree, playing up front as opposed to his usual defensive position, won the man of the match for Fishburn for a strong display leading the line, while Myers shone for Wasps. Sherburn continued their steady climb up the table with a 3-0 win at Hunmanby United Reserves. 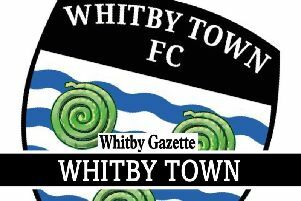 Centre-back Matty Whitehall fired Sherburn in front after 15 minutes with a cracking finish from 15 yards out. Five minutes later and Adam sPaven corner was flicked in from a yard out by Liam Scott. Jordan Lee pulled off two fine saves on the stroke of half-time, and this proved crucial as Sherburn sealed the win when the predatory Paul Mills finished off a one-one one early in the second half to put the game to bed. Whitehall was named as the man of the match for the victors. Commercial and Sleights Reserves shared the honours after a six-goal thriller at the Mount. Jim Neil and Mike Dent fired in Sleights goals to put them in charge but in the 75th minute Macaulay Youngson's bicycle kick pulled Commercial back into the game and Youngson's second drew the scores level five minutes later. Five minutes from time Danny I'Anson neat control and finish looked to have earned all three points for Commercial, but with the last kick of the game centre-back Rich Davies snatched a leveller for Sleights.